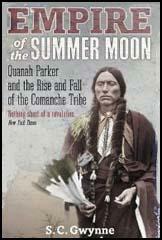 Quanah Parker, a member of the Comanche tribe, was born near Wichita Falls, Texas, in 1845. 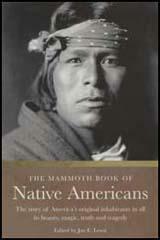 His father was Chief Peta Nocona. 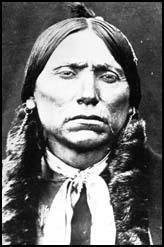 His mother, Cynthia Ann Parker, was a white woman who had been captured by a war party when she was a child. The couple had three children, Quanah, Pecos and Topsannah. Peta Nocoma and his warriors carried out several raids on local white settlements and in December, 1860, Lawrence Sullivan Ross and a party of Texas Rangers were sent out to find Peta Nocona. They found his camp on the banks of the Pease River. Peta Nocoma and his two sons, Quanah and Pecos, managed to escape, but most of the party, including sixteen women, were killed. Cynthia Ann Parker was spared because of her blue eyes and European features. Cynthia and her daughter Topsannah were taken to Camp Cooper where she was identified by Isaac Parker as being the girl who had been kidnapped 24 years ago. Cynthia pleaded to be allowed to return to her Comanche family. This idea was rejected and Cynthia and Topsannah were taken to live in Parker's home at Birdsville. The Texas legislature voted her a pension of $100 a year as compensation for being kidnapped by the Comanches. Parker did what he could to persuade Cynthia to adopt American ways. This strategy was unsuccessful and eventually she had to be locked up to stop her from returning to Peta Nocona and her two sons. In 1863 Cynthia received word that Peta Nocona had been killed and her son Pecos had died of smallpox. Soon afterwards her daughter, Topsannah, died of pneumonia. Cynthia now became desperate to be reunited with Quanah. The Parker family refused and eventually Cynthia resorted to going on hunger strike. Cynthia Ann Parker starved herself to death in 1870. Quanah developed a reputation as a courageous warrior and took part in several raids against buffalo hunters and white settlers. This included the attack at Adobe Walls in June, 1874. He was also desperate to find out what had happened to his mother. In 1875 Quanah surrendered at Fort Sill and was told that his mother had died five years earlier. Later he accepted that his tribe should live on a reservation in Oklahoma. During the next 30 years he encouraged his people to develop agricultural skills. He also served as a judge on the reservation. Quanah Parker died at Fort Sill on 23rd February, 1911. He was buried next to his Cynthia Ann Parker and his sister.